All round these are fantastic strings. They very similar to the D’addario Kaplan Amo, just a little more refined with less excess “noise”. One of the most evident characteristics to me was how responsive the G string was at fast tempi, and the range of character and expression that is available with different bowing positions. In my notes I wrote that the strings are both bright and mellow. I think more accurately they are mellow but with such clarity, focus and projection that they feel bright, open and responsive to play. The E string sings, especially in the upper registers, but somehow Pirastro have managed to balance that against the roundness of the GDA strings. There are a couple of little negatives that do need addressing. They do take a while to settle in but it is worth waiting, but having spoken to a pro soloist his trick was to put a set on his second violin a week before needing them on his main instrument, to keep tuning them up and that worked fine. It’s a bit of a luxurious way to get the strings up to tension but if you have the facility then it saves hours of being out of tune in rehearsals or concerts!! The other main issue is that they are a really loud string and in my experience they tended to overpower the rest of the orchestral section I was sitting in – I felt like I had to concentrate a lot on blending in playing Sibelius 7. However, if budget isn’t an issue, for any soloists I would very highly recommend these strings. They really are a joy to play on. At this point we probably need to add that this blog is our opinion. We have no interest in persuading anyone to buy any particular string or brand. We want to inform our customers to the best of our abilities and share what knowledge and information we have. 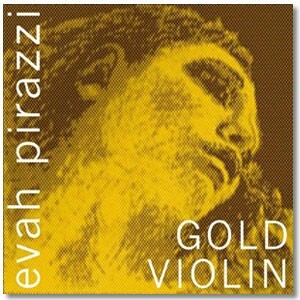 For more information on the Evah Pirazzi Gold or more Pirastro strings, peruse the Pirastro site here!